Maloney’s Custom Ocular Prosthetics was founded in 1948 by Bernard A. Maloney. After serving in the South Pacific during World War II as a surgical and dental technician, Mr. Maloney was selected by the Veteran’s Administration to be trained further in both the field of Ocularistry, as well as Anaplastology. After his training at the Medical School at the University of Baltimore, he returned to Portland as Chief of the Restoration Clinic at the Veteran’s Hospital, as well as the Director of the Prosthetics Clinic at the University of Oregon Health Sciences Center, (currently OHSU). 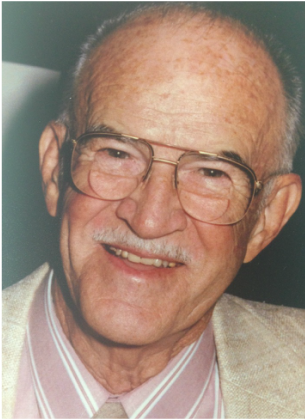 Mr. Maloney worked for the Veteran’s Hospital and OHSU for 27 years, and he retired in 1974. He traveled the South Pacific with his wife extensively before being enticed back into Ocularistry and opening an ocular prosthetics lab at Good Samaritan Hospital in Portland in 1975, and was joined by his daughter Maureen in 1976. It was during this time that Mr. Maloney also became very involved with the American Society of Ocularists, and eventually served as President of the organization from 1985-1986. In 1987, Mr. Maloney retired for a second time, leaving the practice to his daughter Maureen, and his son-in-law Kevin Schou, the two Board Certified Ocularists that run the practice today.